Floral Fantasy Florist & Decorators Ltd. Warm someone's heart and send a summertime shower of colors to say Congratulations, Thank You or Get Well wishes. The Good Old Summertime™ features gerbera daisies, Asiatic lilies, roses, mums and alstroemeria in a frosted red cube vase! It's better than "Good" - it's magnificent! 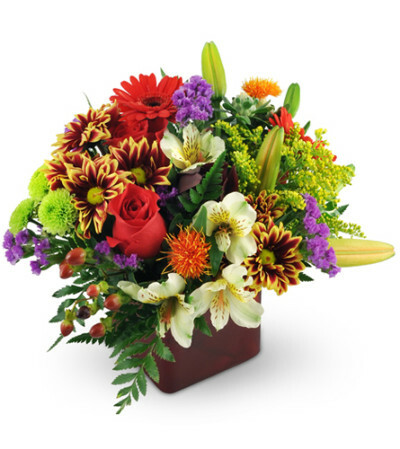 A beautiful bunch of mini gerbera daisies, Asiatic lilies, roses, chrysanthemums, alstroemeria, safflower, statice, solidago, and hypericum berries in a memorable red frosted glass vase. I was very satisfied. I purchased flowers for a friend. She said the flowers were beautiful. 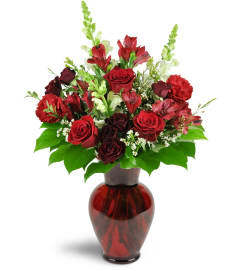 I have used this florist before and was very happy with the arrgement. I would highly recommed them. 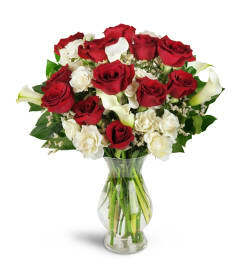 Floral Fantasy Florist & Decorators Ltd. is a Lovingly Florist in Brooklyn. Buying local matters. Discover how Lovingly supports local florists. Copyrighted images herein are used with permission by Floral Fantasy Florist & Decorators Ltd..